There are hundreds and hundreds of people who work where I work, and we have quite a few strategies that we apply in our work on a daily basis but I’m pretty sure that there is no one in the organisation who has the work ‘strategy’ in their job title. (OK, there may be one, but if you meet him, he’s more than likely to introduce himself as the Director of Powerpoint, which kind of supports the point I’m about to make). Strategy is not a thing at the top of the hierarchy in our organisation and I think, compared to other places I’ve known and worked, we’re reasonably good at strategy. I think this is probably a big reason why we are reasonably good at strategy. Because we all own it. Strategy only works if everyone in the team believes in it. If they feel ownership over it, over the ability to act on it, to make it so, every day. Strategy doesn’t work so well if there are a few people who get to go to all the fancy lunches who ‘own’ the strategy. Strategy doesn’t work if it is a land grab, a desirable job title, a person with all of the power who gets to tell people what the idea is and then get exasperated when the execution doesn’t live up to his what his slide deck said it would be. Strategy needs servant leadership. 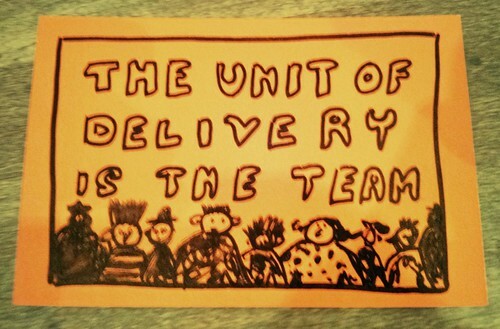 The unit of delivery is the team. Help your team find the right, succinct set of words to describe what they believe they need to do to succeed. Help them to find the opportunities to say those words over and over again â€“ especially as they use them to help make decisions about what not to do, what to do and how to do it. Get out of the way and let them believe it this was all their doing. This is the fourthÂ post in a series of rambles around the topic of strategy in the general vicinity of user experience which Iâ€™m posting as a kind of obituary to the book I almost finished writing then realised was pretty much completely wrong. This is some of the stuff Â I probably should have written instead.Â You can see the first post here,Â the second one here, and the third one here.